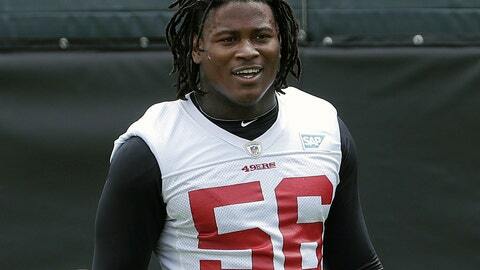 ASHBURN, Va. (AP) — Reuben Foster has been fined two game checks and reinstated to the Washington Redskins‘ active roster after an NFL investigation into an incident of domestic violence found he did not violate the league’s personal conduct policy. The league announced Foster’s fine for two games this season and his new status Friday. Foster will be allowed to participate in all team activities, which includes Washington’s offseason program that begins next week. Foster avoided being suspended in the aftermath of a domestic violence charge from November, which triggered a review based on his previous violations of league policies. Prosecutors in Tampa, Florida, decided in January not to pursue a domestic violence case against the 25-year-old, dismissing the first-degree misdemeanor battery charge. Foster was arrested at the San Francisco 49ers’ hotel in Tampa in November and jailed overnight following an incident involving the second-year linebacker and a companion police identified as the same woman who said Foster hit her in February. The woman later recanted the earlier allegations. The 49ers released Foster, and the Redskins claimed him off waivers but acknowledged he might never play for them. He was placed on the Commissioner Exempt List after Washington added him and finished the season on it. Foster is now cleared to return and play his first game since October. The league says Foster acknowledged responsibility for his actions and has committed to a comprehensive accountability plan developed in conjunction with the NFLPA and the Redskins to avoid future incidents. Allen said the plan includes counseling, a living arrangement, weekly meetings with the team’s player engagement director and chaplain, and some community service. The league said it advised Foster that any future incidents will likely result in more substantial discipline. Foster has so far played 16 regular-season games for San Francisco after being a first-round pick in the 2017 draft.